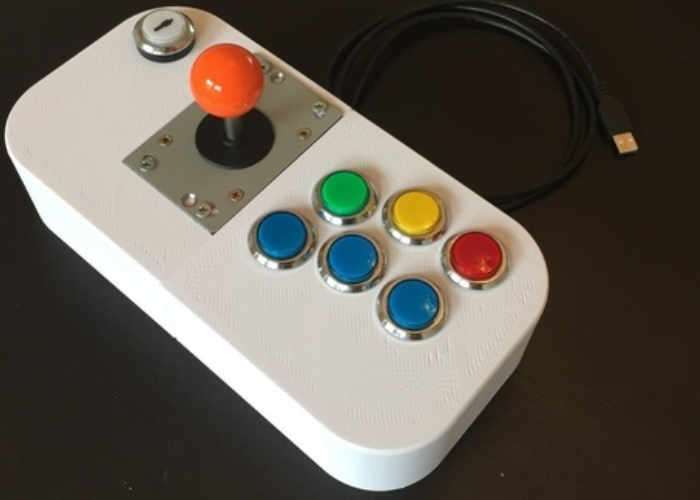 Makers and Raspberry Pi enthusiasts looking for a new project to keep them busy but also enjoy a little retro gaming may be interested in this new Raspberry Pi powered arcade joystick which is enclosed in a neat 3D printed case. The Raspberry Pi mini PC is embedded inside the casing and is capable of running an emulator and also accepting input from the arcade buttons and joystick. PinShaped user keganholtzhausen who created the Raspberry Pi arcade joystick explains a little more about the project and its construction . Summary This Arcade Joystick is printable on printers with at least 150x150x80 print beds. It houses 7 28mm buttons, a standard arcade joystick and still has space for a RaspberryPi and Joystick Controller. BOM: 7x 28mm Arcade Buttons + Switches 1x Joystick like a Zippy 1x Xin-Mo Controller + Wiring Harness a Raspberry Pi running RetroPie Print Settings Printer Brand: Printrbot Printer: Simple Black Rafts: No Supports: No Resolution: 0.400 Infill: 25% Notes: I print using a 0.75 nozzle to get the job done quickly. If you fancy building your very own Raspberry Pi powered arcade joystick jump over to the PinShape website via the link below for the design files. If you enjoy building Pi projects you might be interested in our comprehensive list of Raspberry Pi displays, HATS and small screens.